I am a little embarrassed to expose my interest in graffiti. I had been making stencils with my dad and brother for about 5 years when I decided to make a stack of stencils that I could put together to spray up an entire continent of Africa. There are 47 countries in Africa, not including the islands S�o Tom� and Pr�ncipe. I scaled up a map of Africa to about 90 miles per inch, country by country. On my map, the Ivory Coast was about as big as a Zip disk. I cut the separate stencils out and I was ready for action with just 4-5 colors of spray paint. I actually only used it a few times: Once on this wall near the UCEN, and once for a Halloween costume. Halloween is a big deal in Isla Vista, the apartment wasteland next to U. C. Santa Barbara, and in 1990, I needed a costume. 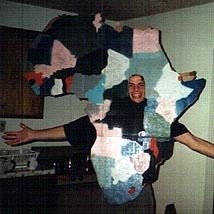 I acquired two large sheets of cardboard and spray-painted Africa onto one of them, country by country. I left Madagascar out. I cut out a hole for my face where Sudan meets the Central African Republic. I then cut the other sheet into a back panel, tied them together and squeezed into the Africa sandwich I had created. Halloween in Isla Vista in not composed of small parties in houses, it is thousands of students and visitors, drinking and roaming the streets in costume. My friends and I did some drinking and a lot of wandering. The drunken masses liked Africa. People that thought that I was South America were quickly berated. One woman approached me from behind, saw my face and announced how surprised she was that I was "white as the driven snow". The costume kind of took a beating that night, and I threw it out, but I still have all the stencils! E-mail me if you want a six-foot Africa on your wall or on a canvas. 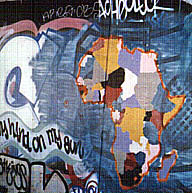 In early 1999 I got an email from an interested party & I traded the Africa Stencils away . It was a nice young woman in England...She sent me a promo copy of 3D Studio VIZ 2 (Kinetix) and all the manuals. She worked for an English 3D Magazine. She didn't send the dongal, however, so I still had to track down a crack for it. :( Still, I can't really complain, as the retail value of that package is US$3200.00, and the manuals that came along with it were invaluable in learning 3DStudio Max! Contact Rob August 13, 2000.